Lightweight, molded-nylon shell carrier puts additional fire power quickly within your reach. Aluminum mounting plate attaches to the side of the receiver using the existing pin/screw holes—no permanent alterations or gunsmithing required. Four- and six-round models available for a variety of popular law enforcement shotguns. Rem. 870/1100/11-87 ESN has a convenient window in the mounting plate that leaves the weapon’s serial number exposed for viewing with the shell holder installed. Designed for armorers and law enforcement agencies who track their firearms by serial number for inventory, maintenance, and record keeping. SPECS: Shell Holder - nylon plastic, black. Mounting Plate - aluminum, black, matte finish. 63⁄4" (17cm) long, 5.3 oz. (152 g) wt. (6-round). Includes mounting screws, pins and instructions. 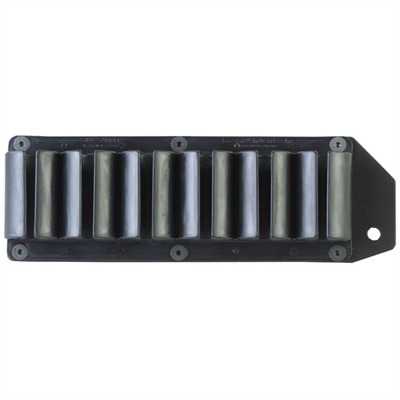 Field-grade forends that extend onto the sides of the receiver must be modified or replaced to provide adequate clearance for 6-shot shell holders.